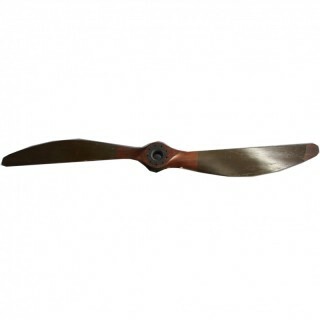 Circa 1900s, timber framed 2 blade propeller with marks of by Siddeley and with marks of: ‘DRG AB 70 31 RH – D2750 P2530 – DEH4 – 200HP BHP – SIDDELEY – G1028 N99’. There are a series of 4 further stamped marks to one side of ‘A.I.D 698’. It has been made from laminated strips of timber and painted green halfway down the blades.